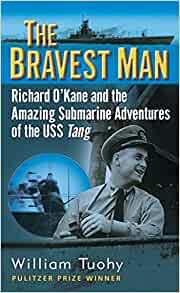 Hailed as the ace of aces, captain Richard O'Kane, winner of the Congressional Medal of Honor for his consummate skill and heroism as a submarine skipper, sank more enemy ships and saved more downed fliers than anyone else. Now Pulitzer Prize-winning author William Tuohy captures all the danger, the terror, and the pulse-pounding action of undersea combat as he chronicles O'Kane's wartime career - from his valiant service as executive officer under Wahoo skipper Dudley"Mush" Morton to his electrifying patrols as commander of the USS Tang and his incredible escape, with eight other survivors, after Tang was sunk by its own defective torpedo. Above all, The Bravest Man is the dramatic story of mavericks who broke the rules and set the pace to become a new breed of hunter/killer submariners who waged a unique brand of warfare. These undersea warriors would blaze their own path to victory-and transform the "Silent Service" into the deadliest fighting force in the Pacific. Start reading The Bravest Man on your Kindle in under a minute. Bill Tuohy served with the US Navy in the Pacific in 1944-46. Then, as a journalist with the Los Angeles Times, he won the Pulitzer Prize for his reporting of the Vietnam War in 1968. Tuohy reported on the conflicts in the Middle East, Central America, Northern Ireland and the Gulf War, as well as the fall of Saigon in 1975 and the Berlin Wall in 1989. He is the author of Dangerous Company, a war correspondent's memoir (NY, William Morrow, 1987). Bill Tuohy is now retired and lives in London. Strange book, this one.......having previously read "Clear the Bridge" Richard O'Kane's own account of his war on Wahoo & Tang, I found myself experiencing a kind of deja vu. Not just in sentences but in whole chapters. Yes, I appreciate that if one tells the same story,accurately recounting the facts & using the same source materials, there's bound to be an awful lot of simlarities, but this book is so similar I wondered why Mr Tuohy (Pulitzer Prize winning author & all) even bothered. Richard O'Kane did such a good job telling his own story that any other book was bound to look & feel like a poor copy and thats exactly how this one reads. Don't usually bother to write reviews but felt compelled after completing this book. Always been interested in WW2 submarine warfare and after reading Iron Coffins by Herbert Warner (itself an amazing book) I wanted an Allied perspective. Very well written, compelling and informative I would highly recommend this to anyone with even a fleeting interest in WW2,subs or naval warfare.